From the order confirmation page, or order confirmation email. This is the most common method of delivery. As a license file (.fhlic). Occasionally we may send out a license key in file. 1. Start the Configuration Tool. 2. 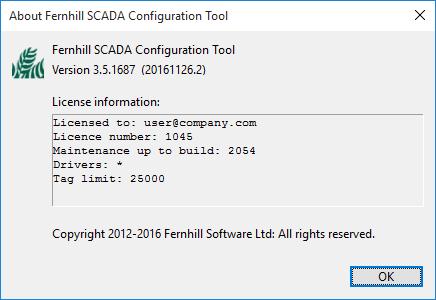 From the Tools menu select Register Configuration License. 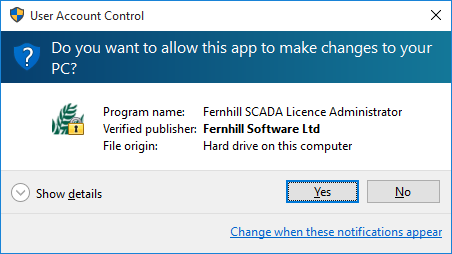 Click Yes to allow the Fernhill SCADA License Administrator to make changes to your computer. 4. Do one of the following. Copy the entire message text from the order confirmation email to the clipboard. Note: In the next step you will paste the copied text into the Register Configuration License Key dialog. The dialog will search the text for a valid license key. 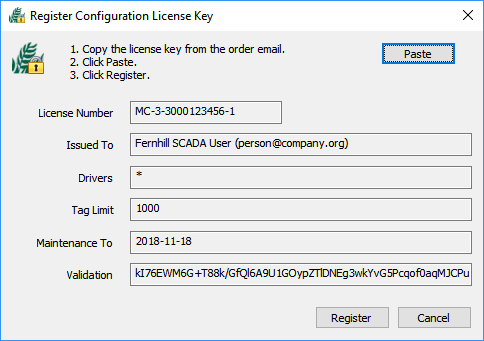 If a valid license key is found, the fields in the dialog will be filled out automatically. 5. Click Paste on the Register Configuration License Key dialog. If you see this error message, go back to step 4 and try again. 6. Click the Register button. 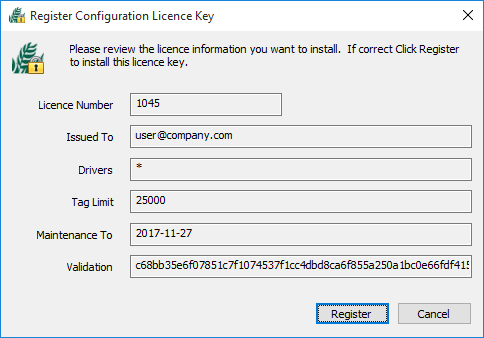 The Register Configuration License Key dialog will register your license and close. On rare occasions we may send you a license key file (.fhlic) as an email attachment. When you receive your license key file, please keep it in a secure location. 1. Copy the license key file (.fhlic) to a suitable location on the computer where you want to register the license. For example My Documents. 2. Open the license key file. 4. Click the Register button. 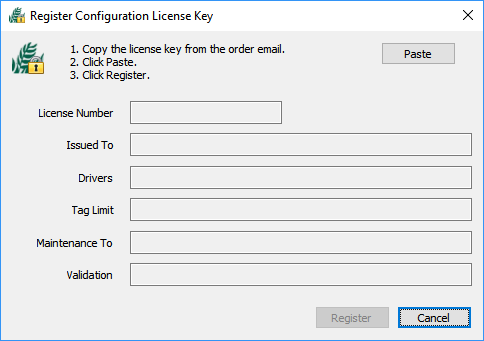 The Register Configuration License Key dialog will register your license and close. Note: We recommend you create a safe backup of your license key file(s).